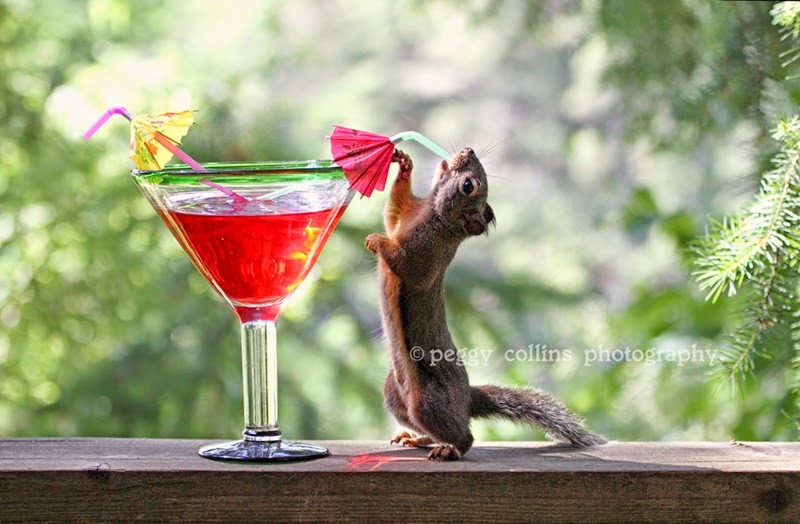 Hallmark tracked me down recently and asked if they could license my photograph of Tipsy, my "pet" squirrel, sipping a cocktail at happy hour. It was very flattering because of course Hallmark is the top of the pile when it comes to greeting cards and they don't accept unsolicited submissions. They're a hard market to break into. By the way, about the photograph...a drunk squirrel is a dangerous squirrel and no alcohol was involved in taking this shot. Neither the photographer (me) or her model was actually drinking at the time. It's just water and red food coloring in the martini glass. So hopefully sometime soon Hallmark will be adding Tipsy to their line of humorous greeting cards. Please let me know if you happen to see Tipsy on a card in the store...that would be great fun!